See your flood zone on the newest FEMA flood map. Special Flood Hazard Areas represent the area subject to inundation by 1-percent-annual chance flood. Structures located within the SFHA have a 26-percent chance of flooding during the life of a standard 30-year mortgage. Federal floodplain management regulations and mandatory flood insurance purchase requirements apply in these zones. A Areas subject to inundation by the 1-percent-annual-chance flood event. Because detailed hydraulic analyses have not been performed, no Base Flood Elevations (BFEs) or flood depths are shown. AH Areas subject to inundation by 1-percent-annual-chance shallow flooding (usually areas of ponding) where average depths are 1–3 feet. BFEs derived from detailed hydraulic analyses are shown in this zone. AO Areas subject to inundation by 1-percent-annual-chance shallow flooding (usually sheet flow on sloping terrain) where average depths are 1–3 feet. Average flood depths derived from detailed hydraulic analyses are shown within this zone. AR Areas that result from the decertification of a previously accredited flood protection system that is determined to be in the process of being restored to provide base flood protection. A99 Areas subject to inundation by the 1-percent-annual-chance flood event, but which will ultimately be protected upon completion of an under-construction Federal flood protection system. These are areas of special flood hazard where enough progress has been made on the construction of a protection system, such as dikes, dams, and levees, to consider it complete for insurance rating purposes. Zone A99 may be used only when the flood protection system has reached specified statutory progress toward completion. No BFEs or flood depths are shown. Coastal High Hazard Areas (CHHA) represent the area subject to inundation by 1-percent-annual chance flood, extending from offshore to the inland limit of a primary front al dune along an open coast and any other area subject to high velocity wave action from storms or seismic sources. Structures located within the CHHA have a 26-percent chance of flooding during the life of a standard 30-year mortgage. Federal floodplain management regulations and mandatory purchase requirements apply in these zones. V Areas along coasts subject to inundation by the 1-percent-annual-chance flood event with additional hazards associated with storm-induced waves. Because detailed coastal analyses have not been performed, no BFEs or flood depths are shown. Areas of moderate or minimal hazard are studied based upon the principal source of flood in the area. However, buildings in these zones could be flooded by severe, concentrated rainfall coupled with inadequate local drainage systems. Local stormwater drainage systems are not normally considered in a community’s flood insurance study. The failure of a local drainage system can create areas of high flood risk within these zones. Flood insurance is available in participating communities, but is not required by regulation in these zones. Nearly 25-percent of all flood claims filed are for structures located within these zones. D Unstudied areas where flood hazards are undetermined, but flooding is possible. No mandatory flood insurance purchase requirements apply, but coverage is available in participating communities. 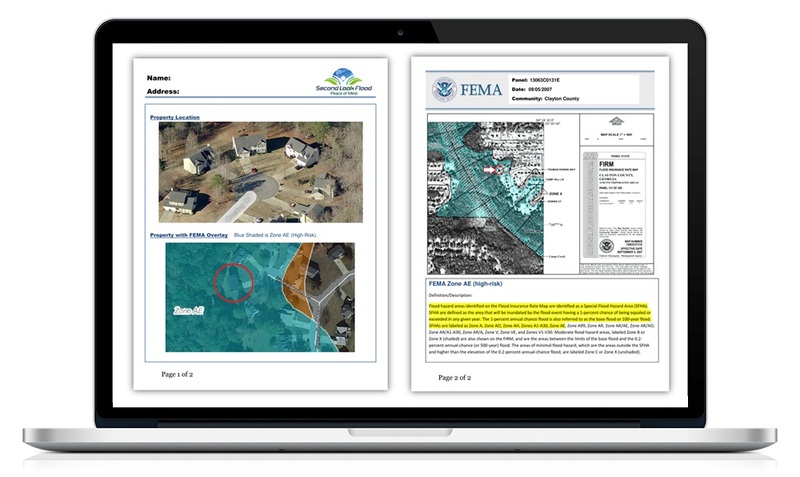 Get a Flood Zone Report and see your Flood Zone – Click here.